The American Crocodile Education Sanctuary (ACES) welcomed three new Wildlife Officers from the Belize Forest Department on Thursday, November 2nd, to our yearly governmental Crocodile Training Day. 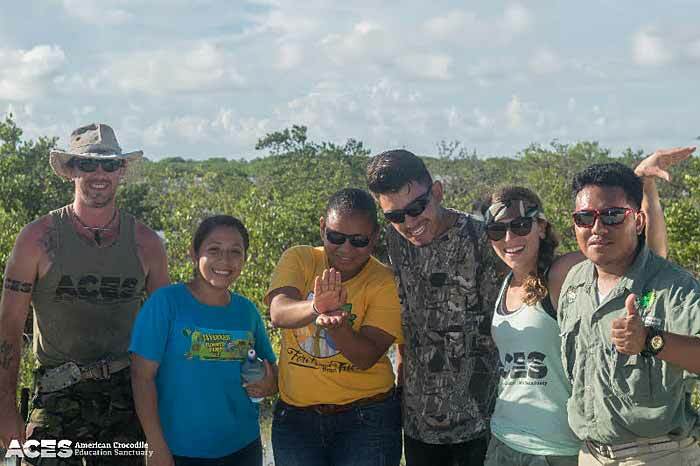 Wildlife Officers, Ms. Shanelly Carrillo, Ms. Kristy Tellet, and Mr. Edwardo Pott, traveled from across the county to Ambergris Caye for a full day of hands-on crocodile training with ACES. Of the 13 species of crocodile found throughout the world, two species call Belize home – Crocodylus acutus, a saltwater species known as the American Crocodile, and Crocodylus moreletii, a freshwater species known as Morelet’s crocodile. Both species are covered under Belize’s Wildlife Protection Act and therefore it is illegal to feed, capture, or disturb crocodiles. It is also illegal to sell their remains or crocodile products. With Belize growing in population, the crocodile-human conflict will increase as we continue to build into their habitat. But with proper education and enforcement of the countries wildlife laws, it is possible to live conflict-free with these modern-day dinosaurs. The primary goal of ACES Training Day is to teach the officers safe handling techniques in order to further increase their knowledge of one of the many types of wildlife they encounter throughout their careers. Crocodiles are apex predators; and improper capture techniques by untrained individuals can be dangerous for the handlers as well as overly stressful for the animals themselves, which in turn can also prove deadly for crocs – just like birds, they can be physically stressed to the point of death. 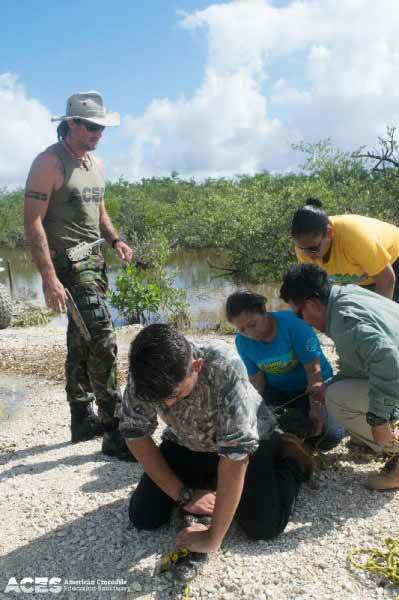 During the course of the day, the officers were introduced to some of the humane crocodile traps utilized by ACES experts. ACES never use capture methods involving hooks or fishing line, both of which can cause serious damage, permanent injury or even death to the animal if the hook is swallowed. The officers were instructed how to safely prepare for a croc capture and provided all the equipment needed. They were then instructed how to get the animal under control using manpower and safety ropes, secure the animal for safe transport if necessary and assess particular health indicators to monitor during the process for the sake of the animals safety. 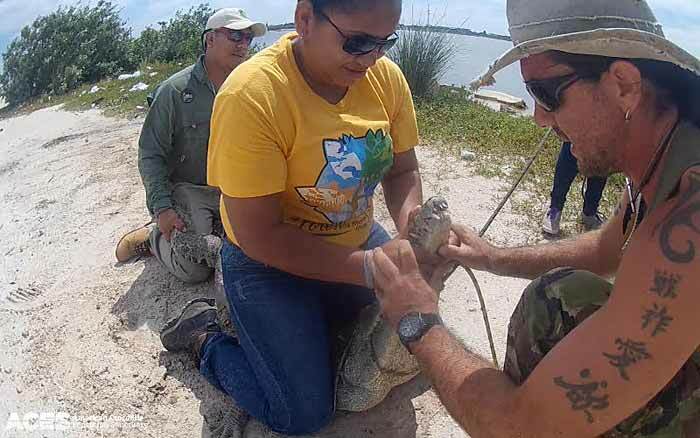 Prior to the re-release of the magnificent creatures, important scientific data is collected regarding the health of the individual crocs, measurements are taken, the croc is sexed and then microchipped using tags donated by Pro-ID. The chips are implanted in the tail for future identification of the crocodiles as per ACES standard operating procedure on every single crocodile caught for ongoing population distribution surveys. All officers got to display their understanding of the newly acquired training during the relocation of a 9-foot crocodile from an area where school construction is taking place. It’s a lot of information to take in and process and, of course, cannot all be learned in a single day, but the officers did a fantastic job and had the utmost respect for the animals. We at ACES are looking forward to working with these enthusiastic Belize Forest Department Wildlife Officers and assisting them with any and all crocodile questions and concerns in the future. If you have any questions or issues with crocodiles in your area, please contact ACES at 623-7920. 3 registered members (Dianadarling, Richard Chapman, 1 invisible), 41 guests, and 8 spiders.